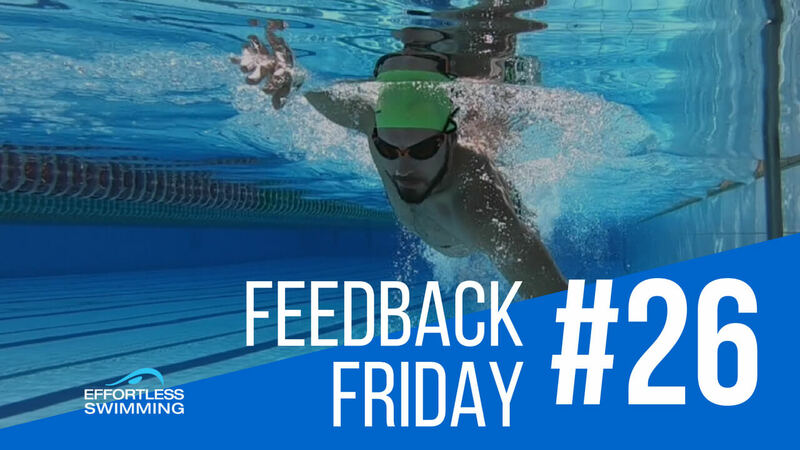 One of the most common questions we get when swimmers come to our freestyle clinics is “What can I do to get faster?” One of the things that we have found to be most effective when it comes to improving your swim speed is improving the catch and improving the pull through. The catch, it’s basically the initial phase in which the hand enters the water. So when you hear a coach or someone else talking about the catch in freestyle, it’s just that part of the stroke. The best way that I like to think of it is it’s all about setting yourself up in a high-elbow position. All that means is if we draw a line from your shoulder to your fingertips in that part of the stroke, the elbow should be in front of that straight line. Most swimmers tend to be either too straight with it or they’re dropping the elbow. That’s very common to see, but if you can begin to keep that elbow somewhat forwards, it will make a big difference with how much water you’re holding in the stroke. One of the things that contribute to athletes dropping their elbow is if they drop their shoulder in the reach and in the catch phase. So, what do we mean by that? You will notice how the shoulder stays up near the side of the face. One of the most important things or one of the best things that you can do to begin to improve your catch position, is keeping that shoulder up near the side of your face and not letting it drop down. 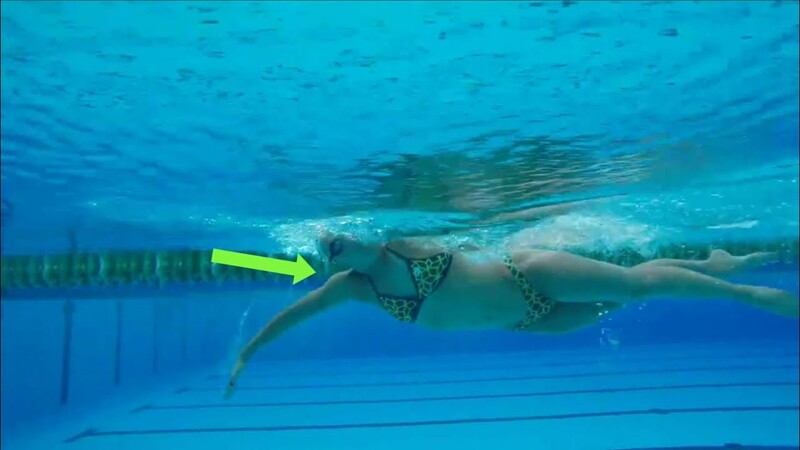 If we look at that with a swimmer who is dropping down with their shoulder, there’s a big gap from the shoulder to the side of the face and you’ll notice that the elbow is dropped. It’s almost impossible to keep that elbow forwards if you drop your shoulder in that position. If we look at that with a few other swimmers, you’ll see it with the Olympic 10K champion, Sharon van Rouwendaal. You’ll notice that shoulder stays up nice and high, allows her to keep that elbow forwards. With another swimmer, Perry Kerr, a professional triathlete. Again, that shoulder stays up, it allows him to get a good catch position. So while he’s not keeping his shoulder up as much as the other two, he’s not letting it drop down too far. The other thing that we like to look for is the position that you get to once you’re underneath your shoulder. There are a couple things that they do here. Number one, their arm makes this half-diamond or triangle shape. Their fingertips point down, their elbow’s off to the side, and you’ll also notice that their shoulders and their upper arm are almost one straight line. That’s really the power position in freestyle. So that’s just another thing that we like to work towards to give you more access to your lats when you’re swimming, which is really what we want to be using when we’re pulling through. They’re going to be the stronger muscles that you can use as opposed to your pecs or the muscles on top of your shoulder. Engaging your lats can really make a big difference with your power. Now the way we like to go about it is we do some very focused and specific swimming, but we also do some quite unique drills, like the Catch Kick. This is one of our favorite drills for improving your catch position. It’s a little bit awkward, it’s a little bit challenging at first, but we’ve found that when swimmers go through this drill, they start to become familiar and comfortable with a better catch. The the other drill that we like to do is Catch Catch Pull. This is a really great drill to start to change the habits that you’ve probably had for a very long time. So, we like to go through this drill to just isolate the catch part, get that right, and then take a full stroke through where you then get to practice that better position with a full stroke.